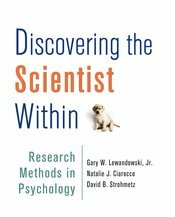 Thank you for your interest in Discovering the Scientist Within: Research Methods in Psychology! We’re excited to get your feedback on this new first edition prior to publication in December. Click to open the Preface and Sample Chapter 8.